Rory McIlroy was three shots behind clubhouse leader Angel Cabrera after his opening round at the Wells Fargo Championship in North Carolina. 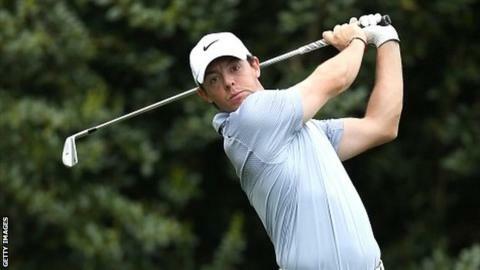 Northern Irishman McIlroy, who claimed his first PGA Tour victory in the event in 2010, carded a three-under 69. Cabrera, 44, reeled off five birdies over a six-hole spell around the turn and leads by one from Open champion Phil Mickelson and Martin Flores. Justin Rose and Scotsman Martin Laird joined McIlroy in a share of seventh. Vijay Singh and Martin Kaymer are among the other players tied on three under par, but Lee Westwood mixed six birdies with five dropped shots in his 71. Starting at the 10th, McIlroy, who recently slipped out of the world's top 10, immediately picked up a shot and was three under after 11. Bogeys at the third and fourth saw him lose ground, although he responded with back-to-back birdies to recover his position. McIlroy, who will be 25 on Sunday, has not won in the United States for 20 months, his last success being in the BMW Championship at Crooked Stick in September 2012. "I gave myself plenty of looks for birdies and felt like I putted a little better than I have done in the past few weeks," he said. "Anything sub 70 is a good score because the wind is a little gusty." McIlroy's fellow Northern Irishman, Darren Clarke, had a four-over 76 in Thursday's first round. World number nine Mickelson birdied four of his opening eight holes while playing partner Rose, the only other top-10 player in the field, holed a remarkable putt from 75 feet for an eagle at the par-five fifth. Cabrera, the former US Open and Masters champion, recorded only his fourth round below 70 this year.